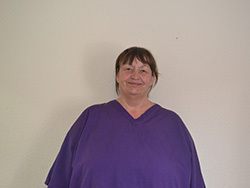 Tessa works in our Wareham Practice on Mondays, Tuesdays and Thursdays and works in our Upton Practice on Wednesdays. Tessa qualified at the Bristol Vet school in 1983. She joined us at the Pet Health Partnership in 2005 and has a particular interest in surgery, cyctology and exotics. She has three dogs and a medley of other small furries at home. Before joining the Pet Health Partnership Tessa worked in The Putney Animal Hospital in London for over 20 years.